This blog post shows how to setup Grafana to display Sawtooth and system statistics. Grafana is a useful tool for displaying Sawtooth performance statistics. Hyperledger Sawtooth optionally generates performance metrics from the validator and REST API components for a each node. 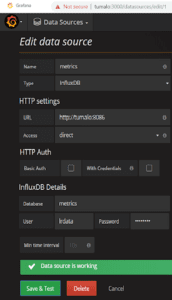 Sawtooth sends the metrics to InfluxDB, a time series database that is optimized for fast access to time series data. Telegraf, a metrics reporting agent, gathers supplemental system information from the Linux kernel and also sends it to InfluxDB. Finally, Grafana reads from the InfluxDB and displays an assortment of statistics on several graphical charts in your web browser. Figure 1 illustrates the flow of data. Figure 1. Metrics gathering data flow. The screenshot in Figure 2 gives you an idea of the metrics that Grafana can show. Figure 2. Example Grafana graph display. 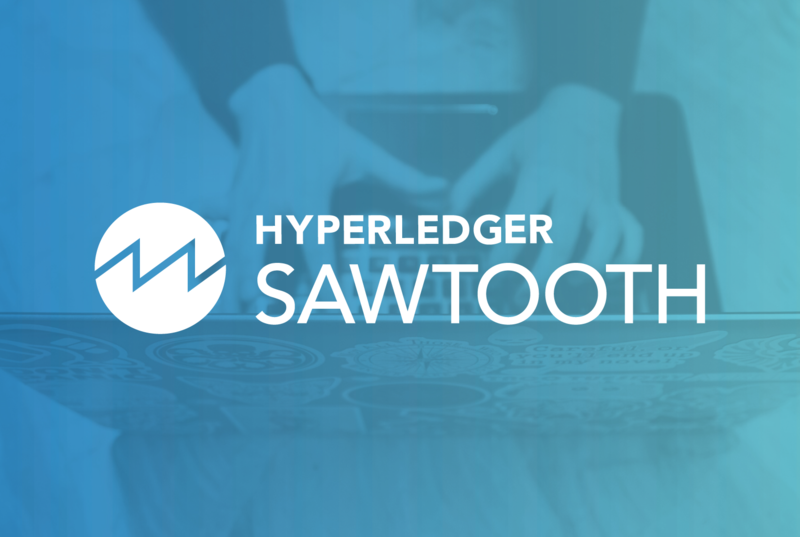 By default, Hyperledger Sawtooth does not gather performance metrics. The rest of this post explains the steps for enabling this feature. The overall order of steps is listed below with in-depth explanations of each step following. The Sawtooth blockchain software must be up and running before you proceed. ProTip: These instructions assume a Sawtooth node is running directly on Ubuntu, not in Docker containers. To use Grafana with Sawtooth on Docker containers, additional steps (not described here) are required to allow the Sawtooth validator and REST API containers to communicate with the InfluxDB daemon at TCP port 8086. 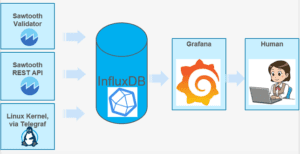 InfluxDB stores the Sawtooth metrics used in the analysis and graphing. Listing 1 shows the commands to download the InfluxDB Docker container, create a database directory, start the Docker container, and verify that it is running. Listing 1. Commands to set up InfluxDB. ProTip: You can change the sample passwords here, pwadmin and pwlrdata, to anything you like. If you do, you must use your passwords in all the steps below. Avoid or escape special characters in your password such as “,@!$” or you will not be able to connect to InfluxDB. Grafana displays the Sawtooth metrics in a web browser. Listing 2 shows the commands to download the Sawtooth repository, build the Grafana Docker container, download the InfluxDB Docker container, create a database directory, start the Docker container, start the Grafana container, and verify that everything is running. Listing 2. Commands to set up Grafana. Building the Grafana Docker container takes several steps and downloads several packages into the container. It ends with “successfully built” and “successfully tagged” messages. Configure Grafana from your web browser. Navigate to http://localhost:3000/ (replace “localhost” with the hostname or IP address of the system where you started the Grafana container in the previous step). (Optional step) If you wish, change the Grafana webpage “admin” password by clicking the orange spiral icon on the top left, selecting “admin” in the pull-down menu, click on “Profile” and “Change Password”, then enter the old password, (admin) and your new password and, finally, click on “Change Password”. This Grafana password is not related to the InfluxDB passwords used in a previous step. Click the orange spiral icon again on the top left, then click on “Data Sources” in the drop-down menu. Click on the “metrics” data source. If the test succeeds, the green messages “Data source updated” and “Data source is working” will appear. Figure 3 illustrates the green messages. Otherwise, you get a red error message that you must fix before proceeding. An error at this point is usually a network problem, such as a firewall or proxy configuration or a wrong hostname or IP address. Figure 3. Test success messages in Grafana. In your terminal, copy the file sawtooth_performance.json from the sawtooth-core repository you cloned earlier to your current directory by issuing the commands in Listing 3. Listing 3. Commands for getting the Sawtooth 1.0 dashboard file. In your web browser, click the orange spiral icon again on the top left, select “Dashboards” in the drop-down menu, then click on “Import” and “Upload .json file”. Navigate to the directory where you saved sawtooth_performance.json. Select “metrics” in the drop-down menu and click on “Import”. Listing 4. Commands to create or update Sawooth configuration. Listing 5. Manual restart commands. Add any command line parameters you may use to the above example. Listing 6. Systemctl restart commands. Protip: The InfluxDB daemon, influxd, listens to TCP port 8086, so this port must be accessible over the local network from the validator and REST API components. By default, influxd only listens to localhost. Telegraf, InfluxDB’s metrics reporting agent, gathers metrics information from the Linux kernel to supplement the metrics information sent from Sawtooth. Telegraf needs the login credentials and destination for InfluxDB. Install Telegraf use the commands in Listing 7. Listing 7. Commands for installing Telegraf. The commands in Listing 8 set up the Telegraf configuration file correctly. Listing 8. Create the Telegraf configuration file. Finally restart telegraf with the command in Listing 9. 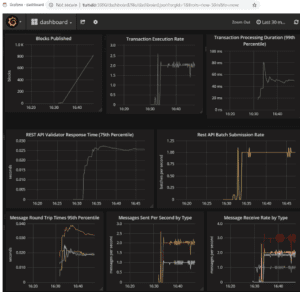 After completing all the previous steps, Sawtooth and system statics should appear in the Grafana dashboard webpage. To see them, click the orange spiral icon on the top left, then click on “Dashboards” in the drop-down menu, then click on “Home” next to the spiral icon, and then click on “dashboard”. This is the dashboard for Grafana. Generate some transactions so you can see activity on the Grafana dashboard. For example, run the intkey workload generator by issuing the Listing 10 commands in a terminal window to create test transactions at the rate of 1 batch per second. Listing 10. Start the workload generator to get some statistics. I recommend changing the time interval in the dashboard from 24 hours to something like 30 minutes so you can see new statistics. Do that by clicking on the clock icon in the upper right of the dashboard. Then click on the refresh icon, ♻, to update the page. Individual graphs can be enlarged or shrunk by moving the dotted triangle tab in the lower right of each graph. Check that the InfluxDB server, influxd, is reachable from the local network. Use the InfluxDB client (package influxdb-client) or curl or both to test. The InfluxDB client command should show a “Connected to” message and the curl command should show a “204 No Content” message. Check that the interval range (shown next to the clock on the upper right of the dashboard) is low enough (such as 1 hour). Check that the validator and REST API .toml files and Telegraf sawtooth.conf files have the opentsdb_* configuration lines. Make sure that the passwords and URLs are correct and that they match each other and the passwords set when you started the InfluxDB container. Click the refresh icon, ♻, on the upper right of the dashboard.